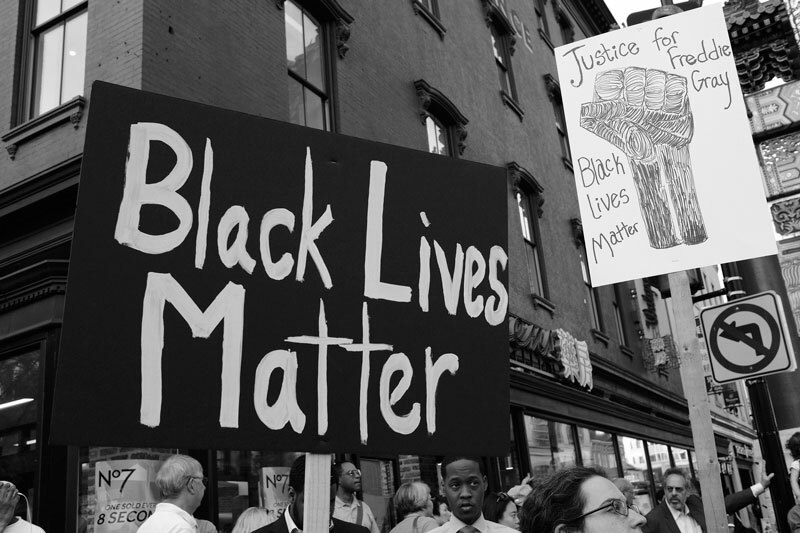 Over the past year, news websites The Intercept and Vice have obtained numerous documents revealing how both the Department of Homeland Security (DHS), the Federal Bureau of Investigation (FBI), and local law enforcement extensively monitored the Black Lives Matter movement. Treating activists as terrorists leads to the criminalization of free speech and assembly. In July 2015 The Intercept obtained hundreds of pages pages of documents that revealed how the Department of Homeland Security’s (DHS) were routinely collecting information on Black Lives Matters movement. This monitoring began just two days after unarmed African-American teenage Michael Brown was shot and killed by white police officer Darren Wilson In Ferguson, Missouri. DHS monitored social media accounts and used Google maps to track the movements of individuals during marches across the country. The American Civil Liberties Union (ACLU) furthers this revelation by pointing out how “information about specific individuals can also be funneled into the Nationwide Suspicious Activity Reporting system, which provides reports to the FBI through regional fusion centers.” Once again, concerns are raised about the trend of the DHS and FBI to view non-violent leaders of social progress as domestic security concern. In August 2015 Vice News obtained documents about DHS monitoring of protests in Baltimore following the death of Freddie Gray in police custody. Vice details that the DHS has specifically monitored vocal social activists and dissenters. Identified as a “professional protester … known to law enforcement”, prominent Black Lives Matter activist DeRay Mckesson was monitored via social media websites. Additionally, the documents obtained from Vice showed that DHS in Baltimore, as elsewhere, mapped the movements and locations of protesters. A common thread amongst revelations about DHS monitoring of Black Lives Matter protesters is that it carried out such monitoring under the guise of “situational awareness.” While DHS maintains it does not spy on political protesters, both the American Civil Liberties Union and Center for Constitutional Rights maintain that situational awareness is used as a cover to conduct political surveillance under another name. Equally disturbing are reports by the Baltimore Sun and Mother Jones that ZeroFox, a cyber security firm, directly monitored Black Lives Matter activists who had a strong presence of social media. This information surfaced in a confidential “Crisis Management Report” prepared by the private firm on the Freddie Gray protests and available on the Mother Jones website. Among the activists monitored were McKesson and another prominent activist Johnetta “Netta” Elzie. In the “Crisis Management Report” by ZeroFox, both individuals were identified as “threat actors.” While Maryland’s governor claimed zero collaboration with ZeroFox, in emails obtained by the Baltimore Sun, the private firm’s CEO discussed with the Mayor of Baltimore and the head of Maryland’s FBI intelligence partnership program discussed ZeroFox gathering surveillance on the Baltimore protests. ZeroFox later maintained that the report in question was prepared “pro bono.” The emails also mention ZeroFox briefing “classified” partners at Ft. Meade Army Base about the protest, and ZeroFox has a past history of working with the New York City Police Department. Both the FBI and DHS maintain that they do not police political beliefs. However, both agencies continue to collect information on individuals and groups that appear to have done nothing more than participate in the Black Lives Matter movement, under the guise of “counterterrorism” operations in the case of the FBI, and in pursuit of “situational awareness” for DHS. FBI and DHS spying on lawful activities protected by the First Amendment is not only a threat to civil liberties, but also an indication that law enforcement views black activism as threatening. Nekima Levy-Pounds, a law professor who was also one of the Black Lives Matter protesters arrested at the Mall of Americas, has compared law enforcement monitoring of Black Lives Matter protesters to past monitoring of civil rights protesters, as both are intended “to curb nonviolent peaceful protesting,” which feels all too similar to civil rights protesters generations ago. Reminiscent of COINTELPRO days, the FBI and DHS have found new justifications to undermine the rights of Americans. While in the past it might have been hunting “subversives,” today it is “counterterrorism” or “situational awareness.” Yet, the effect is the same. This is a cause for concern, and should warrant widespread attention and reform. At a time when race relations are at the forefront of the national agenda, law enforcement should not be used to chill the speech of those fighting for racial justice. Congress is tasked with the responsibility of providing oversight to the FBI and DHS. It is time they take on their responsibilities and put an end to political spying.